1820 – The Mayflower of Liberia – Minister Daniel Coker led a group of 86 free blacks from New York Harbor aboard the Mayflower of Liberia. They are bound for the British colony of Sierra Leone, which welcomes free African Americans as well as fugitive slaves. The group arrived in Sierra Leone, but were plagued by fever soon afterwards. 1867 – The Peabody Education Fund was established by George Peabody for the purpose of promoting “intellectual, moral, and industrial education in the most destitute portion of the Southern States.” It was used primarily to aids Black suffering after the effects of the Civil War. 1882 – Anne Spencer, an American poet, teacher, civil rights activist was born on this date. Spencer was the first African American to have her poetry included in the Norton Anthology of American Poetry. 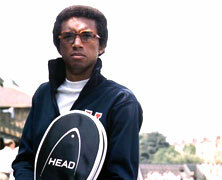 Tennis player Arthur Ashe dies on February 6, 1993. Ashe was the first African American to win the Wimbledon, U.S. Open and Australian Open championships. During heart bypass surgery, Ashe contracted the HIV virus from a tainted blood transfusion and eventually died from AIDS. On , He was posthumously awarded the Presidential Medal of Freedom by President Bill Clinton on June 20, 1993. Walter E. Fauntroy was born in Washington, D.C. He went on to become a District of Columbia delegate to the House of Representatives. Bob Marley, Jamaican reggae star is born.